At least 66 students of Panjab University have been booked on sedition charges for protesting against the fee hike in the campus. Following an outcry over the move, a senior officer of Chandigarh Police said that the charges would be dropped if no ʹsubstantial evidenceʹ is found. Chandigarh Police SSP Eish Singhal said, ʹPolice had slapped sedition charges on the students, but the charge shall be dropped if no substantial evidence is found during investigation against those bookedʹ. At least 40 people, including 22 policemen, were in the protest. At least 52 students had been arrested till late Tuesday evening and will be produced before a court on Wednesday. 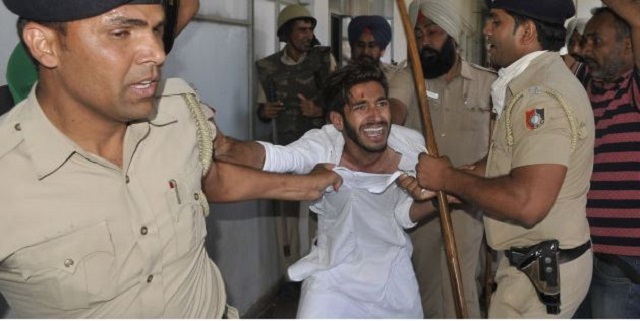 Students were also booked under other sections of the Indian Penal Code (IPC), including 147 (rioting), 148 (rioting, armed with deadly weapon), 149 (unlawful assembly), 332 (causing hurt to deter public servant from performing his duty), 353 (assault or criminal force to deter public servant from performing his duty) and 308 (attempt to commit culpable homicide), the Indian Express reported. The PU Senate had approved the hike in March for new admissions from the 2017-18 academic session. The annual fees for BA and BCom courses, for instance, have been hiked to Rs 10,000 from Rs 2,200. The fee for MPharma is the highest at Rs 1.5 lakh.